When I was a little boy, stories were told around the fireplace about ancestors who were Barons to the monarchy in Portugal and high magistrates to the Tudor monarchy. I always found this exciting and special. I was also a bit skeptical as there were no documents to this effect --only antique photos that could have been gathered at any antique store. Over the years, I made some cursory searches on the web and obtained information about my father and his parents' origin, but nothing was certain, and I had a fair amount of doubt because we are a family known for telling good yarns or, to put it more bluntly, having a proclivity for embellishment. In September 2009, I decided to do further research on the Portuguese family story to determine where legend and fact intersected. I contacted the Portuguese diplomatic office in Providence, RI and was directed to the Portuguese Consulate in New York. After explaining my intent, I began to correspond with the most important contributor to this story, Miguel Carvalho. He was enthusiastic about my personal Portuguese project and we began to work with the scant information I had-- the surname Soares, the City of Porto and the legend of a family connection to the wine trade. Soon afterwards, I received an email from a history professor from Porto named Gaspar Pereira. He was generous with his research finding that, in 1780, there was a business concern called Soares & Irmao (brother) LLC, and that the business was comprised of two brothers-- Jacquin Manoel Soares and Jose Henrique Soares. Jose Henrique Soares was awarded peerage as the Baron of Ancede by Queen Maria II da Gloria in 1842. The Soares enterprise was registered with the government and took credit for shipping 50 barrels of wine, believed to be port, to England in the late 18th century. In about 1780, Jacquin Manoel moved to England to supervise the distribution of their wine; it happened to be the time of the French Revolution and there was an embargo of French wines in Britain. Professor Pereira provided additional information (with dates and times) about the family wine business between Portugal and England. At the same time, there was another unexpected and welcome development. I was contacted by a soon-to-be- confirmed, distant relative from England named James Yeowell. He found me on Facebook because my middle name is Lodington and he, who was also a Lodington, was coincidently engaged in a similar genealogical pursuit. It was an important link for me because Jacqim Manoel married Camilla Basset Lodington, the daughter of Thomas Lodington, and the dates and times lined up with my story. I was now hot on the family trail. Early in October, another important development occurred. Miguel, who was following my progress, undertook exhaustive work and began to call libraries, police and numerous agencies trying to make contact with anyone with the Soares name and a connection to Ancede. He excitedly emailed me that he had contacted Frederico Ancede, the 6th Baron of Ancede, a potential family member. It turns out that Ancede is a bucolic suburb west of Porto where there are structures that have been associated with my family since the 14th century. I dropped everything and emailed Frederico immediately. Meanwhile, my wife and I started planning a trip to Portugal, with ample time scheduled for Porto. 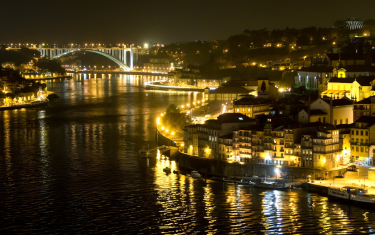 We gathered information on the Porto wineries (which are called port lodges), hotels, restaurants, and Porto itself. I emailed Frederico with our itinerary, and I asked if we could meet to discuss the family connections and ancestors. Frederico is a public prosecutor in the Portuguese judicial system and works long hours and even weekends. In spite of his intense work schedule, Frederico invited my wife and me to dinner at his home in Porto. I became convinced that the family legend was soon going to transform into fact. We arrived in Lisbon on a Monday, and drove to Porto with stops in Amarante and Coimbra. Once at the hotel in Porto, I emailed Frederico to confirm our dinner meeting at his home on Friday evening. The week passed slowly and I was overly anxious for Friday to come so that I could finally meet a legitimate cousin, with direct ancestral links to my family. Finally Friday came and Frederico arrived at our hotel at about 7 p.m. and drove us to his home. We had no idea what to expect. Frederico's home is a condominium in a prosperous section of Porto. Once we got off the elevator, the condo door opened and we were warmly welcomed by his entire immediate family. We met his mother, who is our contemporary and a history teacher at the secondary level, his younger brother who is a wine entrepreneur, a younger sister who is finishing her college studies in industrial psychology, and his lovely wife Isabel, an executive with Banco do Portugues do Investimento. After introductions were made, we were served a fine white port wine and traditional Portuguese soup. I believe the soup had a squash base and was flavored with various spices and herbs. Dinner followed, and it consisted of the classic roasted piglet presented on a platter-- replete with a head and four feet. The pork was complimented with a potato chip type of side dish. Portuguese sparkling wine was served with dinner. The conversation was equal to the cuisine, being a perfect balance of humor and laughter with a smattering of politics and personal anecdotes. The evening concluded at 2 am, a testimony to the genuine enjoyment felt by everyone around the table. During the evening, Frederico offered to drive us around Porto the following day to see the sizable family home and a monastery built by the family in Ancede in the 1850's, as well as the Roman Catholic church in the Lapa section of Porto. This church is juxtaposed to the Soares family mausoleum where generations of Barons of Ancede are buried. The Soares family contributed significant funds for the construction of the church at the behest of King Joao II (John). 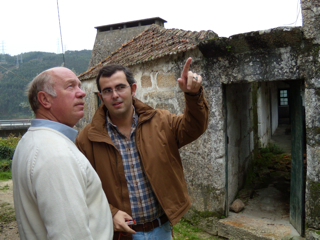 Our last stop was at Frederico's paternal home in the town of Soalhaes - Marco de Canavezes. It was a charming 17th century stone building, resting on the side of a mountain overlooking a valley, with a freeway dissecting the view. We returned to our hotel fired up by Frederico's fascinating tour of the family homes, and other religious buildings with a direct connection to the Soares legacy. It exceeded all my expectations and, to boot, we had discovered a vibrant, modern city with excellent shopping and some fine restaurants, of which Dream Chic was our favorite because of its excellent local fare and personal, welcoming service. My trip to Porto, where I met family members who warmly accepted and entertained my wife and me, has rapidly escalated to the top of the list of my life’s most valuable experiences. I was humbled to learn how much my family has contributed to Porto's culture and economy. I now have another home, in Porto, and look forward to many return trips to Portugal. Michael L. Soares lives in Portsmouth, RI with his wife Lucille. He is a retired Captain, US Navy and currently is an adjunct professor of Industrial and Labor Relations at Salve Regina University. He holds a BA from the Virginia Military Institute and MS from the University of Rhode Island. He spends his free time yachting and playing hard ball in senior baseball leagues.